Hard water stains are unsightly and embarrassing. The build up of calcium, lime, iron or other minerals make your fixtures, appliances, windows and glass look like they aren't clean. No matter how often you clean or how hard you scrub, the hard water stain won't budge, with out the right cleaner. Here are some solutions to quickly and easily get rid of your worst hard water stains, for good. 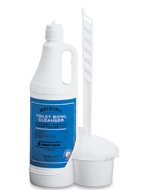 Watkins Toilet Bowl Cleanser is the most powerful bowl cleaner available. It cleans, deordorizes and removes hard water and rust stains from your toilet bowls with out scrubbing. Simply squirt the bowl cleaner around, under the rim, let it sit for a few minutes, swish the bowl with a soft brush, then flush dirt and hard water stains away. Depending on your water's hardness, use once a week to prevent hard water stain and mineral build up or once an month where hard water stains are less of a problem. For really bad hard water stains or heavy mineral build up try this to quickly and easily clean the bowl, pour a bucket of water in the bowl, this will reduce the water level, apply a generous amount of bowl cleaner and leave sit for 15 minutes or longer. A quick swish with the bowl brush should remove all or most of the stain, but if not a second application usually does the trick. Because this cleanser is so powerful it's only recomended for use on vitreous china, this the material toilets are made from. This is one of Watkins best selling products in Canada. Order your Watkins Toilet Bowl Cleaner from our safe, secure Watkins store or request your free Watkins full product catalog and order by mail or phone. If you are looking for a safer non-toxic alternative, look no further! 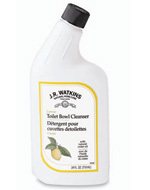 J.R. Watkins Natural bathroom cleaning products feature formulas that are biodegradable and phosphate free. The ultra concentrated cleaners are naturally derived so they are safe for the environment, your home and your loved ones. Throw away your rubber gloves, the naturally delightful aromas will leave your home smelling fresh and sparkling clean . . . naturally. 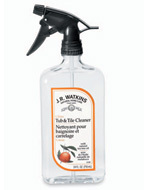 For a fume free non-toxic hard water stain remover Watkins Natural Citrus Tub and Tile Cleaner is your solution, it cuts through soap scum and hard water stains with out harsh chemicals. Nothing will out clean Tub and Tile Cleaner when it comes to cleaning most bathroom and shower surfaces, especially ceramic tile, glass, fiberglass showers and tubs. Glass shower doors will shine. It even removes green stains. This powerful but safe, fast acting cleaner will instantly foam away oil, soil, and mineral deposits. The natural essential orange oil formula is less irritating, so you can breathe easier and will leave your bathroom fresh and fragrant. Use as a spray and wipe cleaner with the convenient trigger sprayer. Tub and Tile is also great for safely removing stains and pollution from the exterior of your R.V., mobile homes and from your exterior windows. This environmentally-friendly cleaner is safe for your septic system too. Watkins Natural Lemon Toilet Bowl Cleanser works against even the toughest hard water stains on your toilet, sinks, tub and tile! 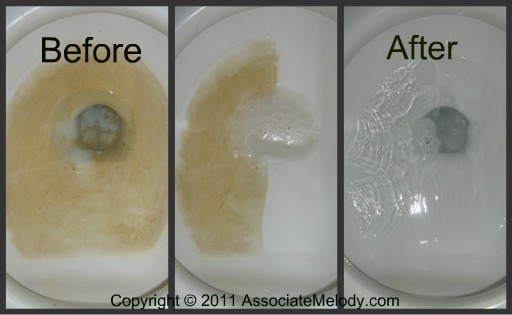 Use this cleaner to safely decalcify your toilet. This cedar-based formula is one of the least acidic or caustic cleaners on the market making it safe for septic systems. And because the formula is made up of replenishable and sustainable ingredients, you leave the smallest possible footprint on the environment! The natural plant based formula reduces odor, mold and mildew and is earth friendly, biodegradable and phosphate free. Shop for Watkins Toilet Bowl Cleaner and other bathroom cleaners in our safe, secure Watkins store or request your free Watkins full product catalog and order by mail or phone.